When my skin suddenly decided to become wildly sensitive a few years ago, my first thought was to change the products I used. Face wash, moisturizer, shampoo—these seemed like probable culprits. In spite of switching to natural options, the breakouts persisted. But while folding my floral-scented clothing fresh out of the dryer, I had a realization. It had to be my laundry. At first, I didn’t give much thought to the detergent I used to wash my pillowcases, towels, and clothing. But to stop my face breaking out, I had to make a change. Now, I’m not the only one who’s experienced problems from scented laundry detergent with irritating ingredients. In a recent thread on Reddit, hundreds of users had a discussion about having the same problem. When they used fragrance- and dye-free options, the pimples and cystic acne on their cheeks cleared up. Same with fabric softener. Plenty of people got itchy rashes and pimples until cutting it out of their routine. To make sure your skin stays happy and clear, keep these tips in mind before your next load of laundry. Sorry but that brightly-colored laundry detergent bottle promising tropical scents has got to go. Instead, choose one suitable for sensitive skin that’s both hypoallergenic and free of any sort of fragrance or dye. “It’s often scents and dyes that cause the problem. The majority of laundry detergents and fabric softeners include them, even some products marketed for baby laundry,” Dr. Engelman says. “To minimize the chances of contact dermatitis, be alert and look for detergents labeled fragrance-free and dye-free.” The two options Redditors swear by? All Free Clear and Tide Free & Gentle. Dryer sheets might be responsible for helping your laundry stay soft and static-free, but your skin is not a fan. Even dermatologists say they’re a trigger for people: They coat your linens and clothes with a layer of wax and grease, not to mention fragrance, that can be especially irritating to your skin. It might sound scary adding pungent-smelling white distilled vinegar into the washing machine with your laundry, but putting a cup in the fabric softener dispenser can seriously save your skin. 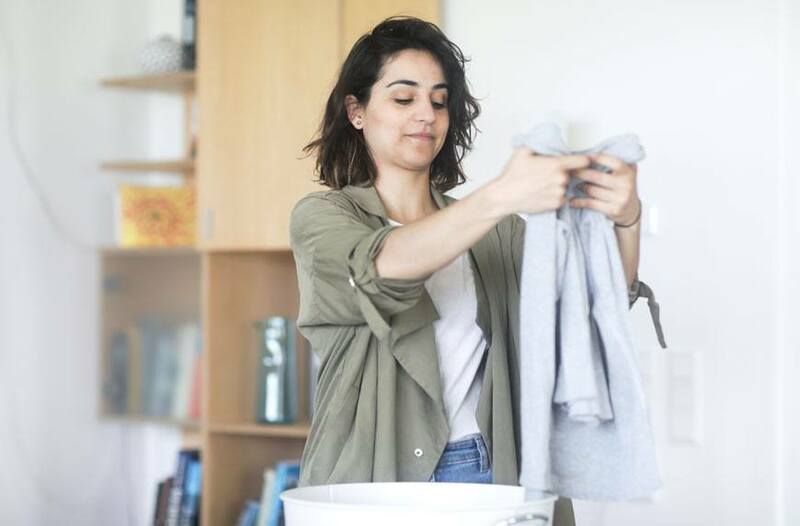 Not only is it a fragrance-free way to soften your clothes, but it also gets rid of some of the irritators that are commonly leftover: “It removes detergent and mineral residues from the clothes. There will be no toxic fragrance clinging to the fabric,” says environmental consultant Marilee Nelson. Yep, stress causes acne—but it’s a little more complicated than that. And if you’re dealing with acne on your back, watch out for these ingredients in your shampoo.